"Above the rooftops of Havana" (panorama) © 2009 Falk Lumo 37" print. All rights reserved. "Theater at dusk" (cinemascope) © 2009 Falk Lumo Staatstheater am Gärtnerplatz in Munich, Germany at dusk. Processed from 19 images. "Sky Cathedral" © Falk Lumo 2008 -- West Portal of Cologne Cathedral (Kölner Dom), 157m high. Built over 600 years, from 1248 to 1880. The full size print (240dpi) is 89cm x 370cm. 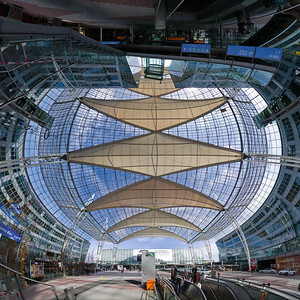 "Solar Air Sails" © Falk Lumo 2010 -- Munich Airport Transfer Area panorama, 1x1m print (240dpi). Mercator projection. "Altmarkt of Schmalkalden, Thuringia, Germany" (panorama) © 2012 Falk Lumo In the middle of the image, you find St. George Church (1509). 100" print. All rights reserved.